Back to basics tip #26: If you have kids who fight and get upset about how many eggs the others have found, here’s a tip. Color code the eggs. Put the same prizes in each of the colors. Then before the hunt, have the children pick a color. Explain that’s the egg color they need to find and that’s the only color they can put in their basket. This also works well when there are older and younger children who pick up eggs at different speed. » Tell me… How do you prevent a brawl at egg hunts? Check out my blog, you’ve been awarded! What a great idea! My little one isn’t old enough for easter egg hunts yet but when he is I’ll have to remember that tip. My friends mom doesn’t put the goodies in the eggs. 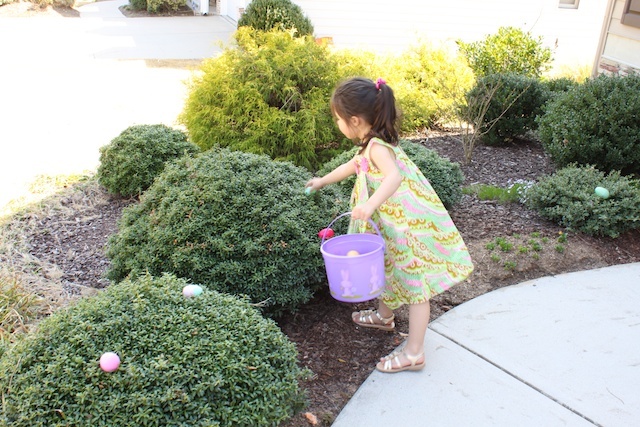 After the kids find the eggs they trade in each different color for a gift that she has picked for each of the kids. That way it doesn’t matter if one kid finds more than another. All of the blue ones are traded for a gift and so on for the other colors and sizes. Great idea! Not sure why I hadn’t done that yet since we color code everything else for the kids. for older kids, (5+) number the eggs so that each child picks up a no.1 no. 2, no. 3….